If you have any questions about the OCEAN BREEZE information page below please contact us. 22m/71ft sailing yacht OCEAN BREEZE (ex.TELEFONICA BLUE) is a former Volvo Ocean Race boat that came third in the 2008-2009 VOR. Built in 2008 by Kingship Marine and last refitted in 2018, this carbon composite vessel accommodates up to 14 guests and is a true delight for those who want to experience the thrills of a true regatta yacht. The exterior deck area is designed for racing with a responsive aft helm station and a cockpit amidships for alfresco dining. There is also plenty of space for sunbathing and observation while anchored in scenic locations. The lower deck is fitted with 14 Pullman berths to accommodate guests cruising from one destination to the next. 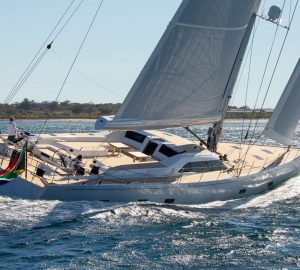 In light winds, S/Y OCEAN BREEZE is capable of a cruising speed of 12 knots using her engines, and she can reach a top speed of 37 knots. Up to 14 guests can sleep aboard in the 14 Pullman berths. We do have available further amenity, owner and price information for the 21.50m (70' 6") yacht OCEAN BREEZE, so please enquire for more information. The luxury yacht OCEAN BREEZE displayed on this page is merely informational and she is not necessarily available for yacht charter or for sale, nor is she represented or marketed in anyway by CharterWorld. This web page and the superyacht information contained herein is not contractual. All yacht specifications and informations are displayed in good faith but CharterWorld does not warrant or assume any legal liability or responsibility for the current accuracy, completeness, validity, or usefulness of any superyacht information and/or images displayed. All boat information is subject to change without prior notice and may not be current.